MIX (Oil/Air Distributing Valve) | Products | Daikin Lubrication Products & Engineering Co., Ltd.
OverviewGrease feed, oil feed, forced lubrication, micro mist systems, and various other systems are being put to practical use as centralized lubricating systems at steel mill. And, efforts to minimize the impact on the environment as much as possible are required. Efforts such as this include the gradual adoption of “oil/air lubrication” that is capable of supplying small amounts of lubricant directly to bearings. Daikin Lubrication Products and Engineering Co., Ltd. is and will be proposing new “oil/air lubrication” solutions in the future. (1) Little lubricating oil needs to be supplied to bearings. (2) Contamination of bearings by foreign matter or coolant can be prevented as the bearing section is filled with air at all times. (3) The environment inside the factory can be kept clean as the discharged oil is collected in an oil discharge pan. (4) Grease and lubricating oil can be disposed of easily as they are not contaminated with coolant. (1) Accurate oil quantities can be reliably supplied. (2) Only a small quantity of air is needed to feed the oil. (3) Adoption of a progressive system ensures a highly reliable lubricating system. (4) Individual oil feeding systems are easily installed at each machine stand or production line segment. 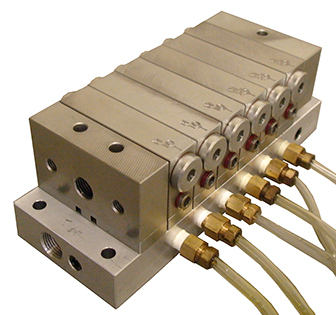 Three to eight units connected in series can be configured in each combination of the above inlet element.